My boyfriend and I have been together for a few years. Things have been kind of up and down, and we were in a really dark place for a while. Then he went away for a few months and things ended before his trip on kind of a high note, so it looked like things were about to change for the better. Now that he’s back, I’m so disappointed! We seem to be in such a rut: pizza on Friday nights, Chinese food on Saturdays, never going out, never trying anything new, etc. I tell him I feel like we’re just doing the same things over and over, not progressing, and basically just right back where we started, but he seems to think everything is fine. I keep hoping for something to change, but it never really does! Is there any hope for us? It’s so funny that you would send this (totally fictitious) letter—really, what are the odds?—because your problems with your boyfriend are the same ones I’m having with Once Upon A Time’s return this week. 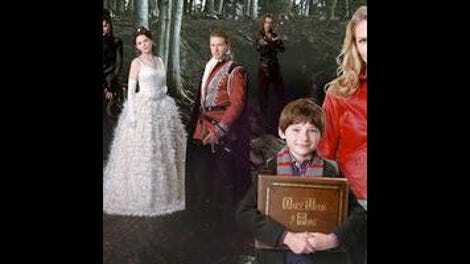 After a fairly impressive midseason wrapup in which Storybrooke disappeared and Henry’s and Emma’s brains, such as they are, were wiped clean of any memory of the fairy tale world, the show managed to demolish any possible plot momentum with its first returning episode. Well done, show! Actually, the loss of the plot progression can be traced to one simple act: Emma drinking Hook’s little blue “bring back your memory” potion. Although something was going to have to happen to bring Emma and Henry back in to the fold, it would have been nice to draw out their New York life just a little but longer so that the neverending saga of goodbyes and Regina’s massive spell last episode were not just made pointless by the mere chug of a bottle. The awesomeness last episode of Hook appearing at Emma’s doorstep is breezily explained away by him receiving a message that her family is in trouble. As the chemistry between Hook and Emma is always one of OUAT’s strong points, the episode does offer some nice interactions of him crashing her dinner date, her getting him arrested and then bailing him out of jail, him being astonished at the awfulness of the New York “brig,” which includes something called “baloney.” Hook sends her to Neal’s apartment, where she finds a camera with Henry’s name on it, which contains pictures of the two of them in Storybrooke, proving they were there. So she drinks the potion, and soon Hook and Emma are swigging rum and sharing meaningful steamy glances again, and she’s compelled to embrace her old “savior” persona (which also involves a very symbolic redonning of her old red leather savior jacket). Her dream life in New York is revealed to be a sham, after her too-good-to-be-true boyfriend Christopher Gorham turns into a flying monkey (don’t you wish you’d taken the blue pill, Emma? ), so she packs up Henry and takes off with Hook for Storybrooke. And here’s where all momentum screeches to an absolute halt. Hook isn’t sure if the new curse wiped out the memories of the fairytale folk, or which ones, or what. All he knows is that they’re back from the Enchanted Forest and are in Storybrooke, having lost the memory of a year of their lives. We expected more from your debut than this dumb curse, Wicked! It’s just like Regina’s curse, except it seems like most of the Storybrookers’ memories are intact (Charming and Snow recognize Emma, after all). The best thing about the year fast-forward is that it helps explain Henry’s growth spurt and Ginnifer Goodwin’s pregnancy, so that at least in Storybrooke she doesn’t have to hide under massive cloaks. But when Emma puzzles, “Who would do such a thing?”, it’s so hard to care. The show never has seemed to decide which universe these characters should reside in: At the beginning of the episode, Snow is downright defeated to be back in fairytale land, dimly announcing to Philip and Aurora, “We’re back” (admittedly, she’s probably still sad about saying goodbye to her daughter for the second time). In the first part of this season, everyone seemed to be all about saving Storybrooke, from Pan’s minions or Regina’s curses or whatever. Now, it is a trap that they can’t wait to escape? To get back to the Enchanted Forest? Again? Hook’s appearance in the previous episode conjured up all sorts of promising developments and questions, like “How in the hell did he make it back to New York from the fairytale world?” Now, these questions seem to be answered in a disappointing fashion, and the ones that remain—like “Why did Wicked wipe their memories for a year and send them all back to Storybrooke?”(revenge against Regina, apparently)—aren’t compelling enough to keep us interested. No doubt the following episodes will explain what happened during this lost year, and I’m really hoping they deliver. What’s so frustrating about OUAT is that there appears to be a limitless supply of fables and legends the creators could choose from, yet even the introduction of an Oz storyline winds us up in way-too-familiar place. A progressive restart can help rejuvenate a series (or a relationship), but not when nothing changes. Sure, the villain is now a Wicked Witch instead of an Evil Queen, but give or take a flying monkey, that doesn’t help much. You can repave it all you want with yellow bricks, but it’s still the same road. So, LW, tell your boyfriend that we must move forward or die, like sharks. Tell him that going backward is fatal. Tell him you are young and fun and want to explore new things, and if he doesn’t want to, you’ll find someone who does. Because being back in the exact same place seems like nothing but a waste of time. Remember how excited we all were to get out of Neverland? Remember? Christopher Gorham turning into a flying monkey is hands-down the best moment of the episode. Christopher Gorham as a flying monkey for the win. The aching hole left by the absence of Robert Carlyle is only mildly helped by a conversation between Neal/Bae and Belle that seems to point to Rumplestiltskin’s eventual return. Carlyle needs to come back, stat. Like, next week, if at all possible. Run for safety from the giant purple magic cloud! Under the gazebo! At least we get to see Philip and Aurora again, even though all we learn is that she’s still pregnant and they seem to be under the influence of the new Big Bad. Oh, and the Ogre Wars are over. Robin Hood is back, now with Merry Men! I would not be surprised by some sort of Dorothy saga for Emma with Charming as the Scarecrow (lacking brains), Regina as the Tin Man (lacking a heart), and Rumple as the Cowardly Lion (lacking courage). Henry is Toto.